Maintaining a successful B2B blog as part of your overall inbound marketing plan can be a challenge. Creating posts that resonate with your buyer personas on a regular frequency can be down right overwhelming. Sometimes the biggest challenge is step 1…identifying topics. We’ve all read the articles and blog posts about how to create and maintain a successful blog. One common tip I’ve read again and again is to create an editorial calendar for your blog. It is a great tip and can really help you stay on track and manage the process. But what happens when the inspiration for topics just seems to dry up or you just aren’t excited about the topic for this week that you came up with several months ago? Don’t worry…there are places you can go to find inspiration. Here are six. Wouldn’t it be nice if you could figure out what types of articles your buyer personas share most often? Then you could plan your editorial calendar around those topics which would not only make your target audience happy but also increase your reach. Sounds great, right? 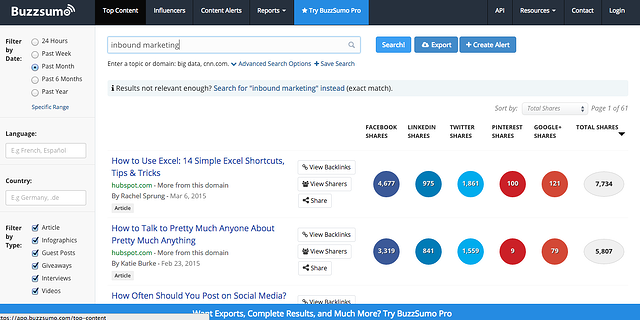 Well, BuzzSumo allows you to do just that. Enter any topic and it’ll show you the most shared articles for that keyword across all of the major social networks for the time period specified. I entered inbound marketing and specified the past month as the time period. It gave me 61 pages of results. How’s that for inspiration? According to Wikipedia, Google Trends is a public web facility of Google Inc., based on Google Search, that shows how often a particular search-term is entered relative to the total search-volume across various regions of the world, and in various languages. In other words, Google Trends allows you to see what topics are currently popular as well as see how popular your particular key words or topics have been over time. Here’s what’s trending as I write this post. 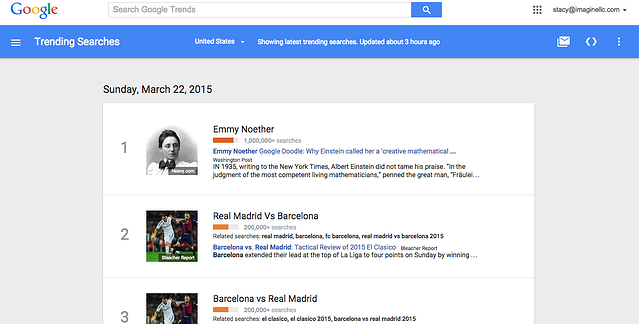 You can also see trends updating and changing using the Google Trends visualizer. Google allows you to see from 1 or 2 topics all the way up to 25 topics at a time. I chose to see 6 at time. If you see a topic that interests you, click on it. When I clicked on Emmy Noether, for example, it gave me a list of sites to choose from to learn more about her. Even in B2B blogging, a trending topic can be tied to a something in your industry or to information that will benefit your buyer personas. For example, it’s March and that means the NCAA tournament is a trending topic everywhere. It is obvious from Google Trends that there are currently many searches focused on the tournament or the teams who are participating. If leadership, team building or winning are important to your buyer personas, why not create a topic that incorporates this very popular event AND allows you to share your message in a way that will resonate with your audience. If you haven’t visited Quora, it’s time you did. Quora is a question and answer site where users can search for answers to their own questions or provide an answer for someone else. There are blog topics everywhere! When I typed in inbound marketing into the search bar, I found 100s of questions ranging from what is inbound marketing to in what situations is cold calling more effective than inbound marketing to how much does inbound marketing cost. These questions could lead Imagine to several topics for our blog. Type in one of your key words today and find your own inspiration for what could be many great topics. The article describes how a few players in the investment industry are warring through their blogs. I think it might lead to an Imagine topic down the road. Who knows, you might find some inspiration there today too. Topsy allows you to search and analyze topics that have appeared in tweets dating back as far as 2006. I use it to look for topics that are trending or for more information about my own key words. For example, today I typed inbound marketing here. 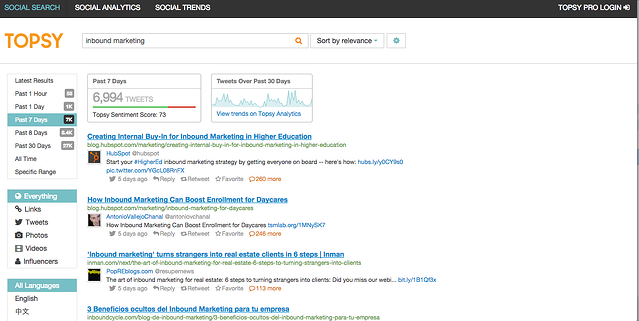 And I found out that inbound marketing has been mentioned in nearly 7,000 tweets just over the last 7 days! Just skimming the first two pages inspired many, many future topics for Imagine. Check it out for yourself. Not only can you see what is trending right now, but you can search any topic you wish. This source of inspiration will always be one of the best. After all, it is the very audience you’re trying to attract, convert, close and delight that is providing the inspiration. Meet with your new sales team, your sales development team and your customer service representatives on a regular basis to stay in tune with what your customers and prospects are asking about. Answering their questions will surely lead to some of your best performing blog posts. 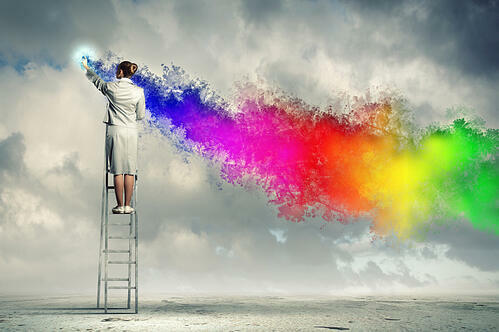 Inspiration is everywhere. Sometimes you just need to know where to look. I think these six sources will help you keep your editorial calendar full and fresh for a long time.